The Seabourn Odyssey Ocean View Suites are the smallest accommodation onboard, but they are still larger than most other staterooms at sea. They feature a panoramic picture window, a generously proportioned living space and large bathroom with separate tub and shower. The Seabourn Odyssey Ocean View Suites are identical to the Veranda Suites with one exception, they do not have a veranda. Instead they boast a very large picture window which offers panoramic views of the ocean. The Seabourn Odyssey Ocean View Suite boasts an impressive 27.5 sq.m. (295 sq. ft.) of internal space. A big marble bathroom and walk-in wardrobe are both accessed from the entry hallway, beyond which is the sleeping area and living space. The décor is bold and modern with sharp lines and a bright, neutral colour palate. Attractive artworks hang from the walls. 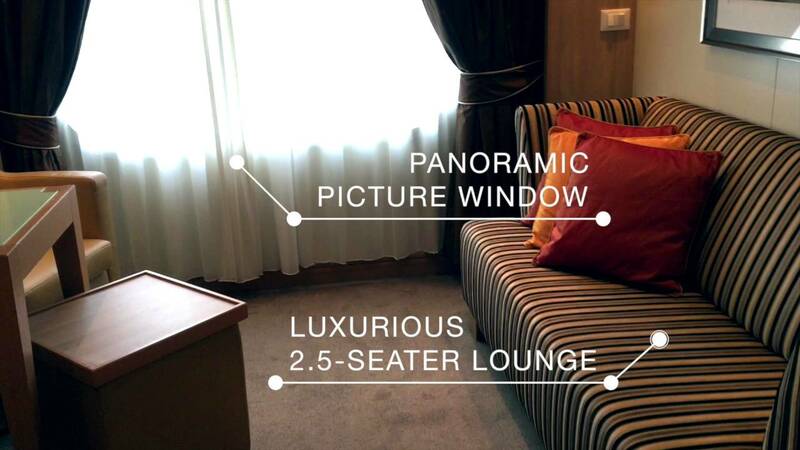 The living area is where the Seabourn Odyssey Ocean View Suite really shines. Unlike traditional stateroom layouts it has no shelving or coffee table cluttering the space. This has the dramatic effect of opening up the area and giving a great sense of roominess. A full sized 2-seater dining table sits on one side with a large lounge against the opposite wall, leaving heaps of space to move in between. A cleverly designed ottoman doubles as a coffee table with the use of a fitted tray top if needed. On each side of the suite two unobtrusive, lightly coloured timber cabinets provide a visual divide between the sitting and sleeping areas. One contains the mini-bar while the other contains the entertainment unit and provides general storage space. In the sleeping area a queen sized bed is framed by a leather bed head and the ingenious design continues with the bedside cabinets including draws with small sliding compartments to accommodate reading glasses or other little items that have a habit of getting lost. A set of low sideboard cabinets opposite the foot of the bed provides loads of shelf storage. Fresh flowers sit atop the sideboard. As is customary on modern ships there is ample room for luggage to be stowed beneath the bed. The walk-in wardrobe (accessed from the hall) provides more than enough clothing storage space with plenty of wooden hangers and deep draws. Next to the walk-in wardrobe the large marble bathroom is sure to impress with deep double vanities, a full size bath and separate shower. There is a generous amount of storage space around the vanities and on the shelving below. The initial bathroom setup includes Hermès soap, however this is replenished throughout the voyage with Molton Brown spa products. In the hall between the walk-in wardrobe and the bathroom is an unobtrusive vanity area with a handy mirror for checking yourself before leaving the suite. CruiseOyster recommend the Seabourn Odyssey Ocean View Suite for its generous size, smart design and great value.